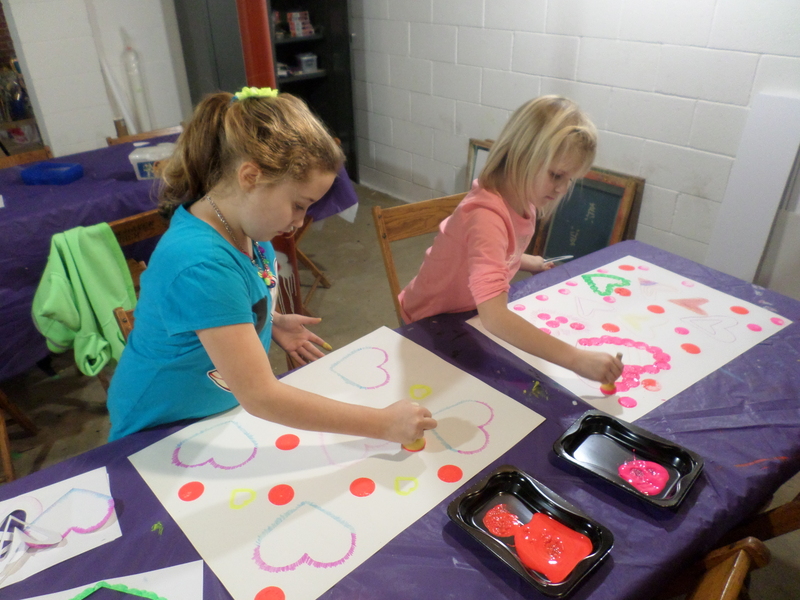 Tuesday afternoon art class explored painting with yarn recently. 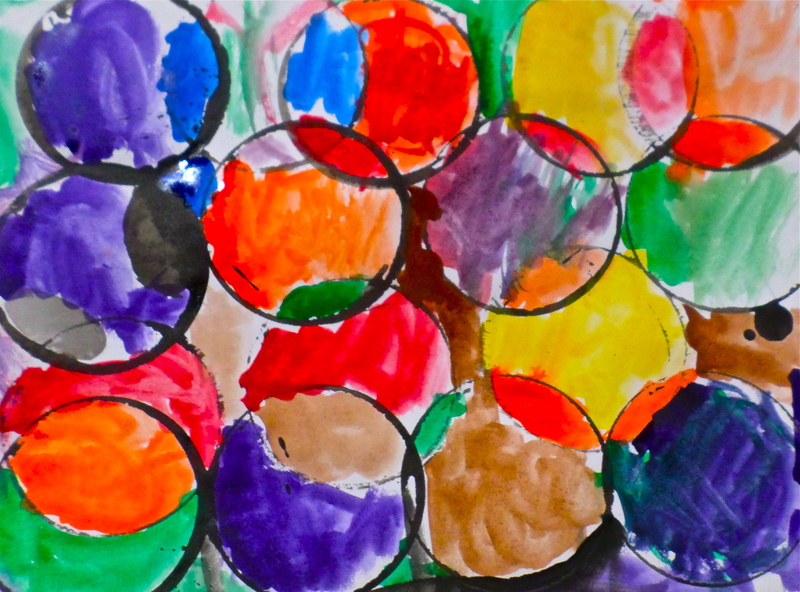 After soaking their yarn in tempera paint, students slowly pulled the yarn across their paper to create patterns of color. 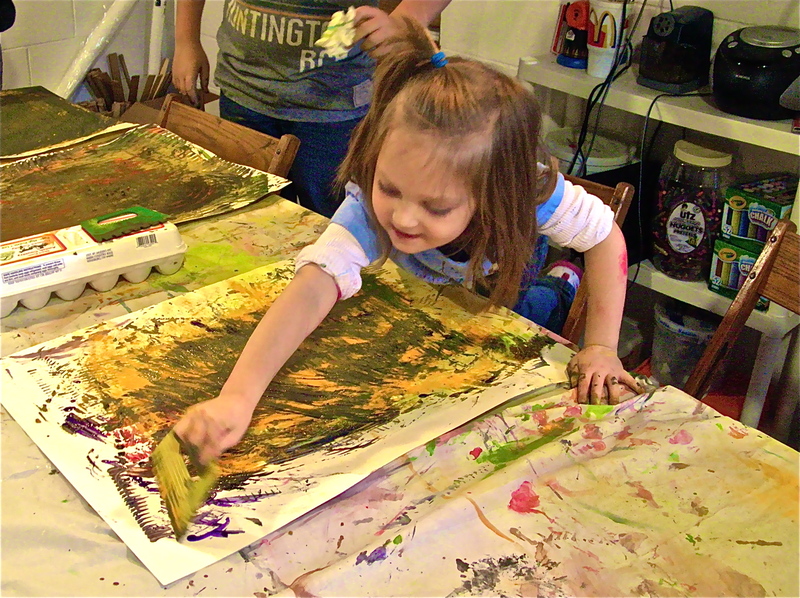 Everyone had fun exploring this new method of painting. The painting process took some time to learn how to master the yarn and control the paint. 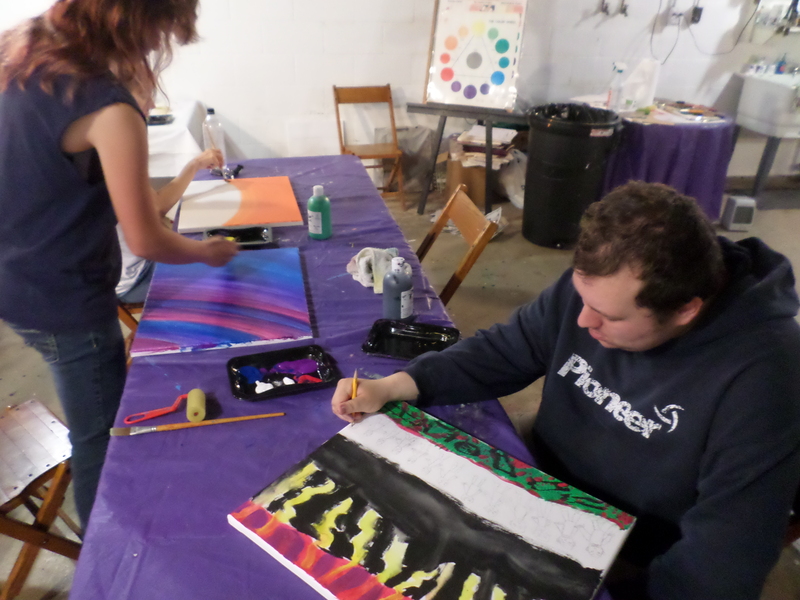 Everyone was very happy with their paintings and learning how to paint in a new way! 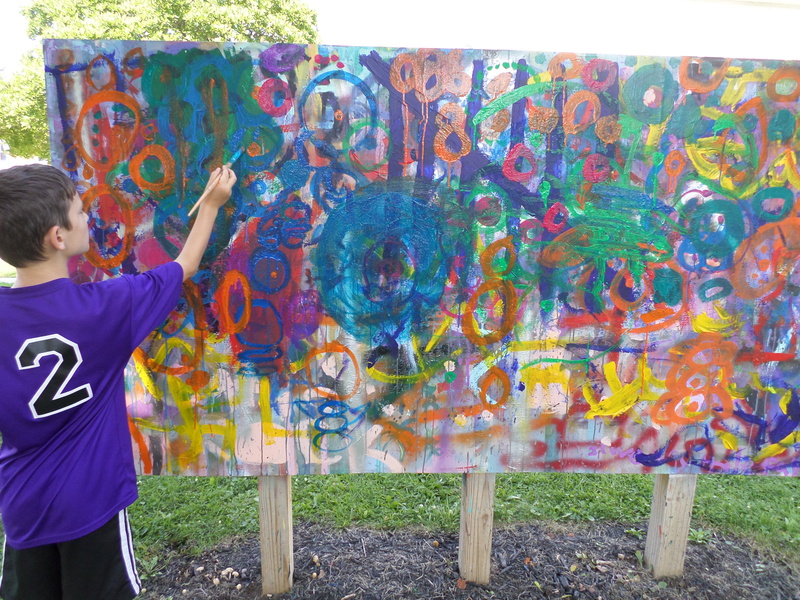 One of the projects at Art Camp this summer was mural painting. 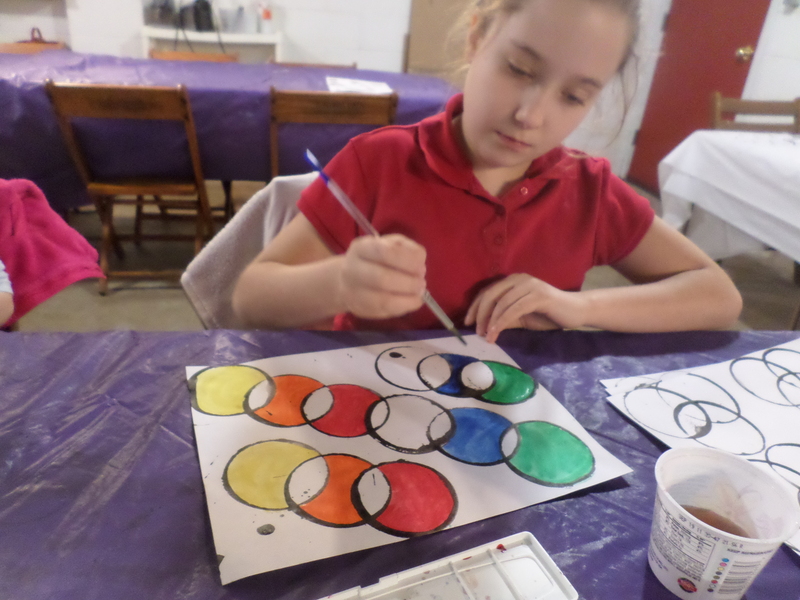 Everyone focused on circular shapes with their favorite color. There were many thoughtful ideas created in our mural. 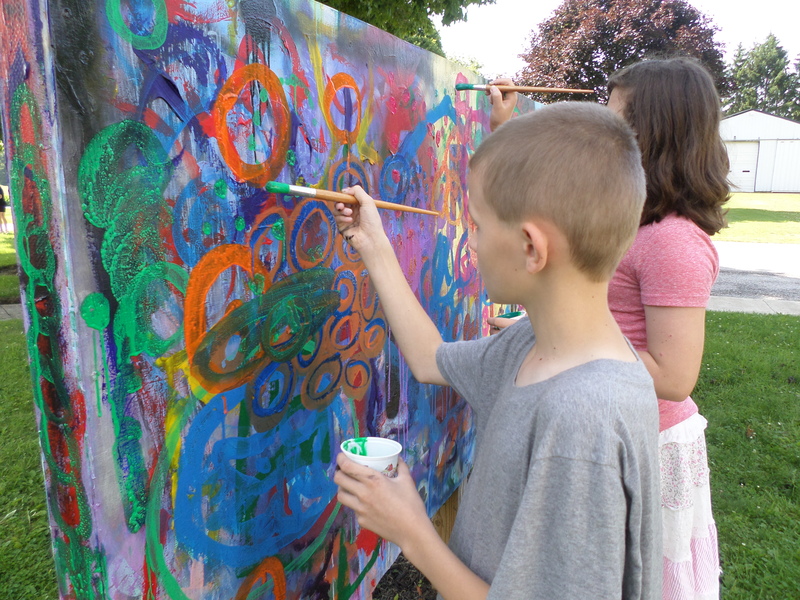 It was great to work cooperatively in creating this outdoor art. 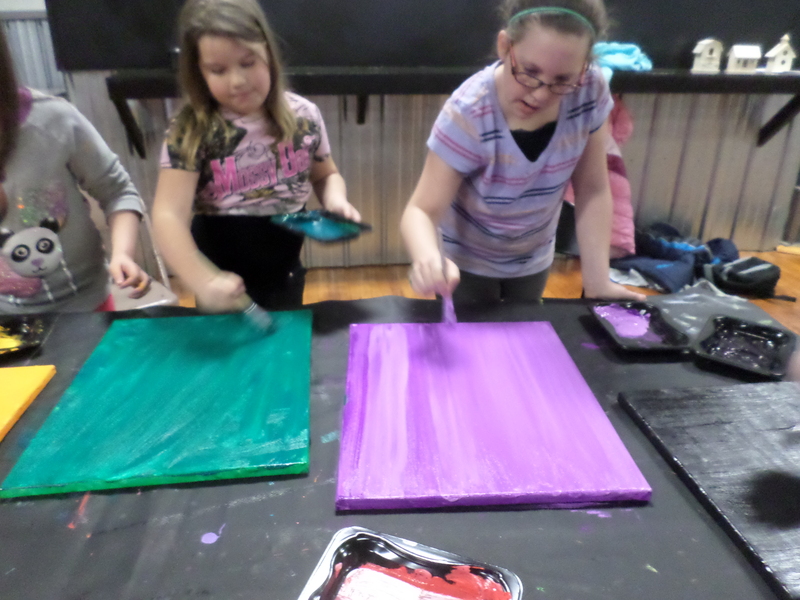 Everyone had the opportunity to be very expressive with paint and brush. I was very happy with the students’ final work on our murals this year! 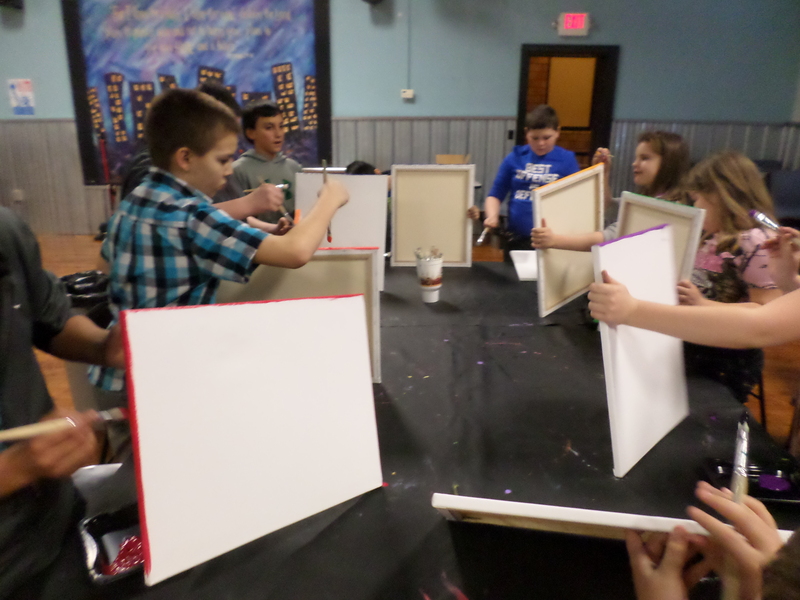 Expressive painting class begins today! 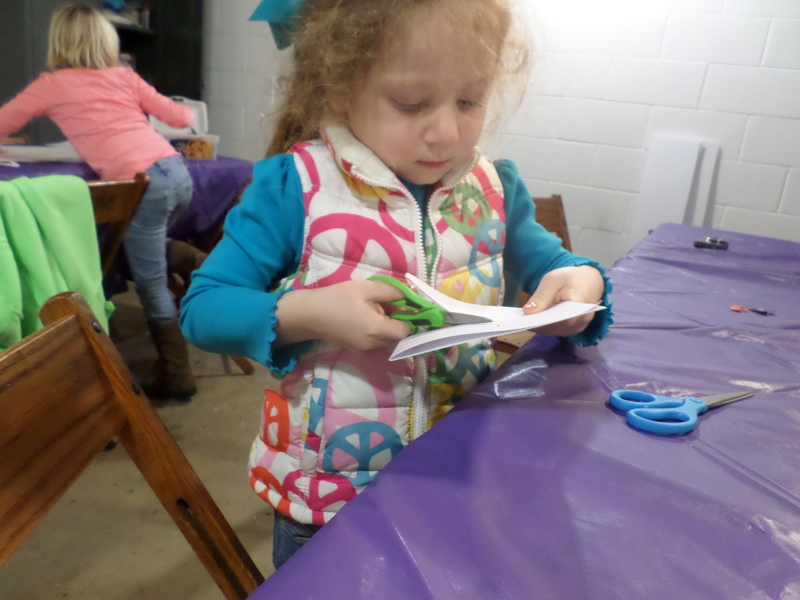 We look forward to a great class and some wonderful time exploring art! 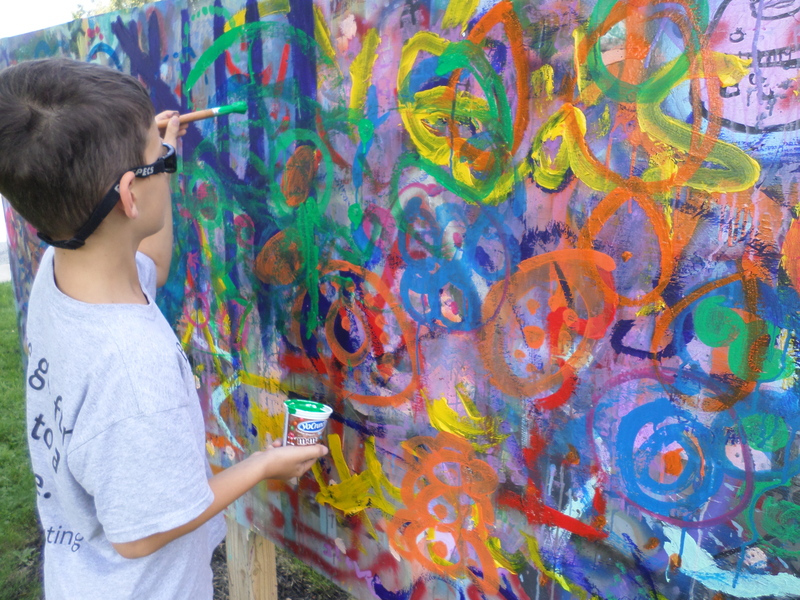 Explore painting with expression using acrylic paint. 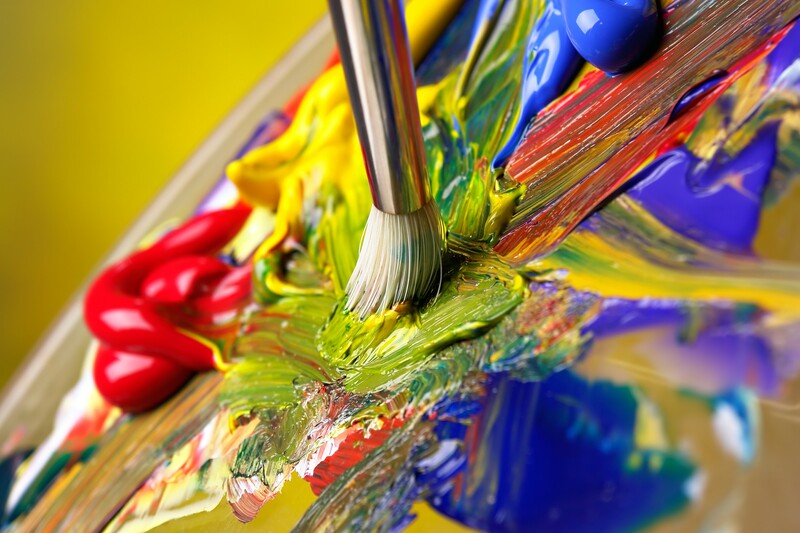 This class will guide you in creating an expressive landscape or allow you the freedom of exploring expression for yourself with a wide variety of materials. 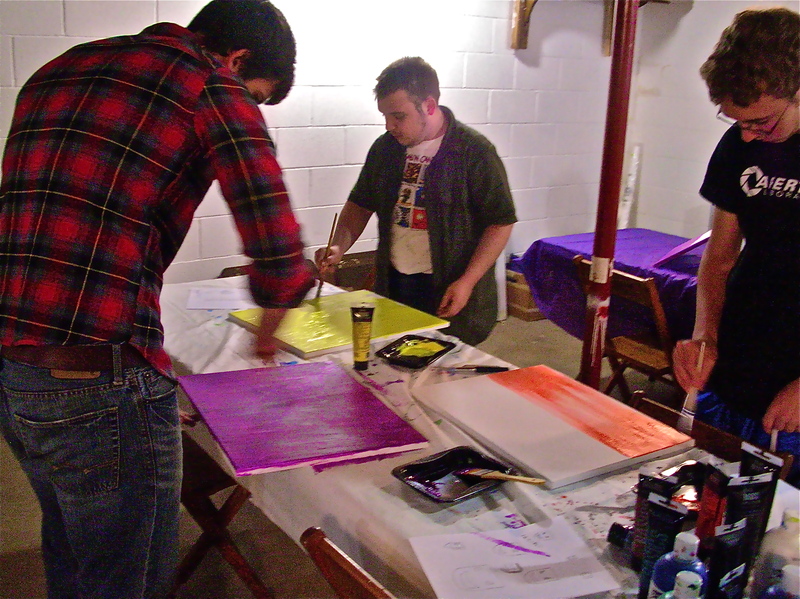 Participants will have the freedom to explore expressionism independently or be guided by the instructor if they wish. 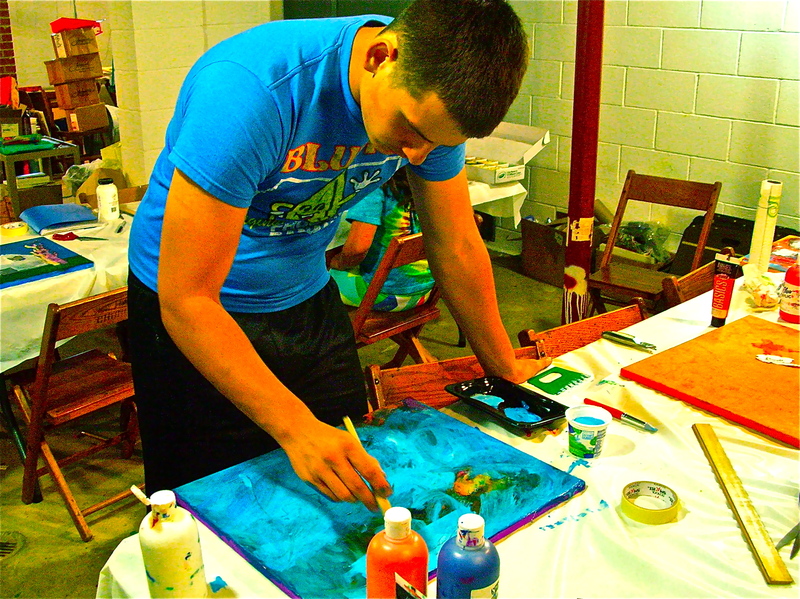 Sign up & prepay for summer classes today! Cash accepted or make checks out to Kevin Casto. Mail your registration to: Kevin Casto 802 S. Main St. Willard, Ohio 44890. 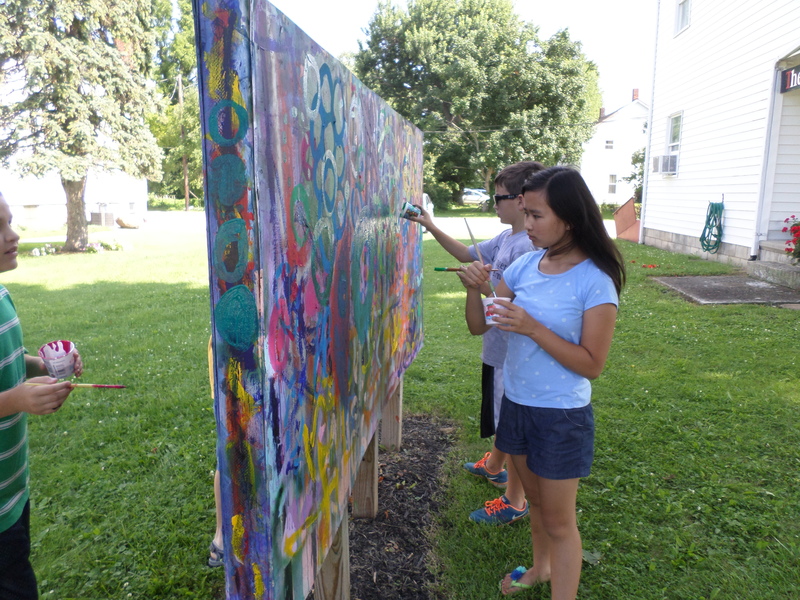 The Art Junction is located at 2634 Prairie Street New Haven, OH next to the New Haven United Methodist Church. 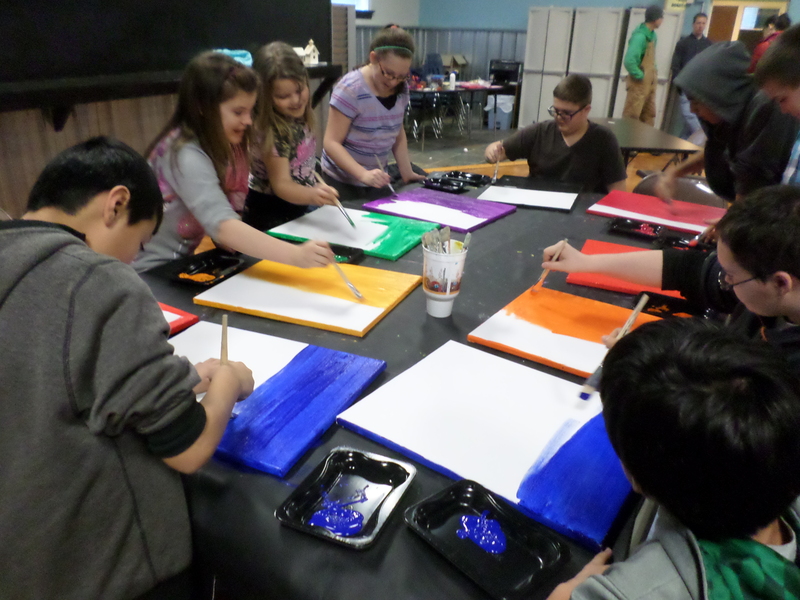 Our final Wednesday Afternoon Art Class for the winter was full of color. 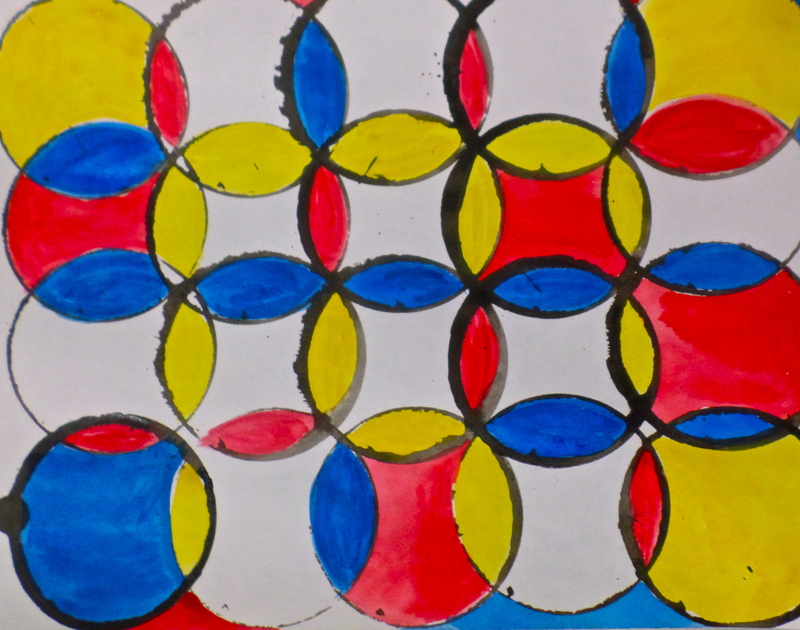 Students began with their prints made in the previous class. 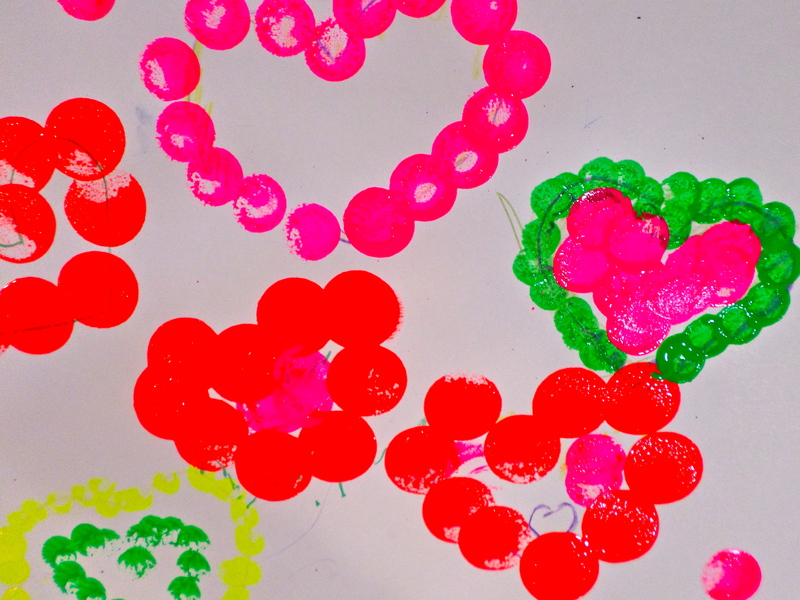 Everyone chose colors to create a pattern of color on their prints. 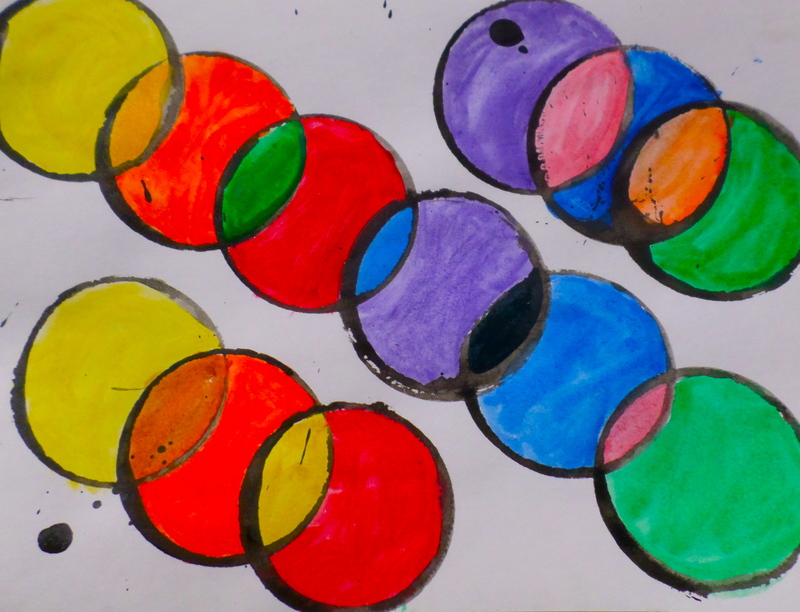 This required focus and concentration as every student created their own combinations of colors. 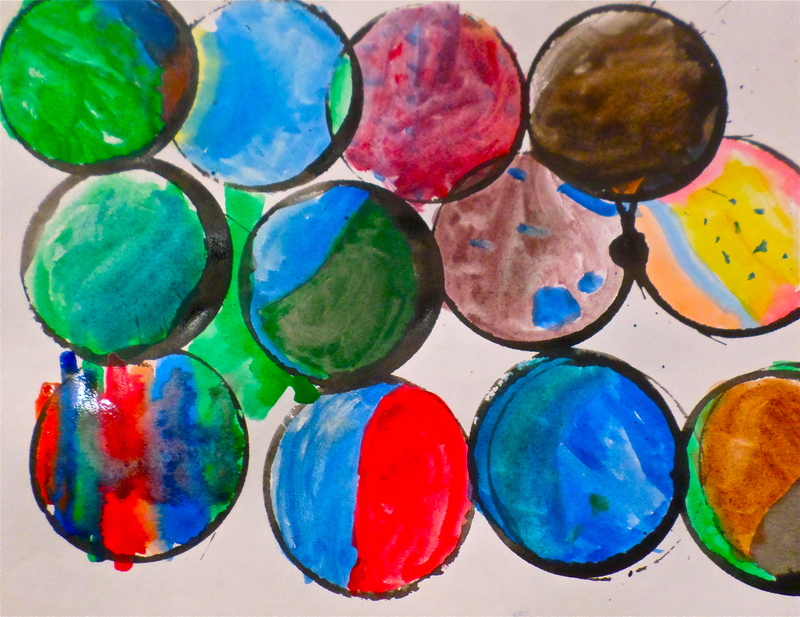 Students enjoyed the process of creating a monoprint full of color with watercolor paint. 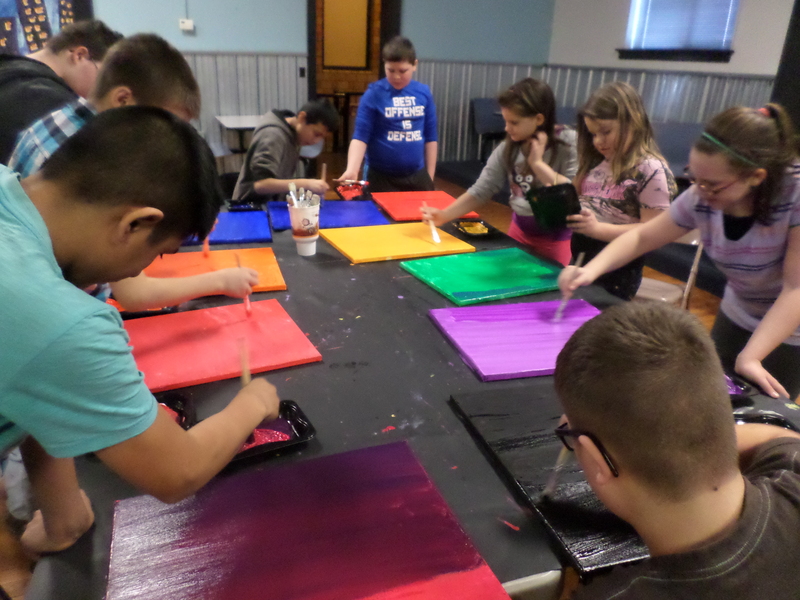 We began the painting project at the Willard Hope Center this past week. 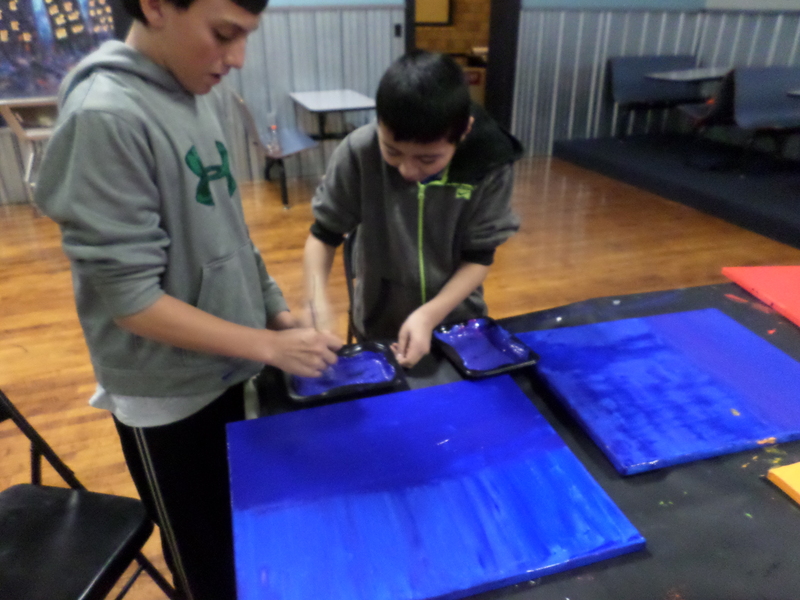 Student members eagerly began the process of giving their canvases a base coat of acrylic paint. 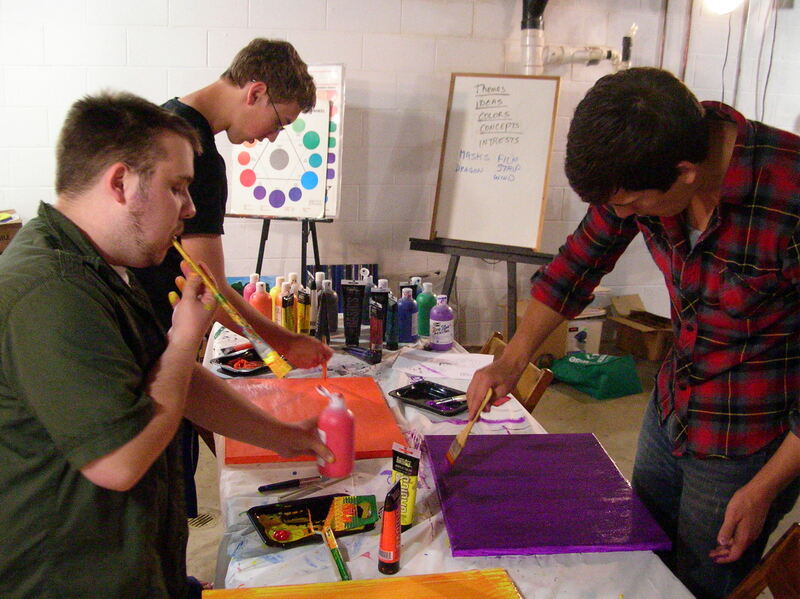 For many of the students it was their first encounter with painting on canvas with acrylics. 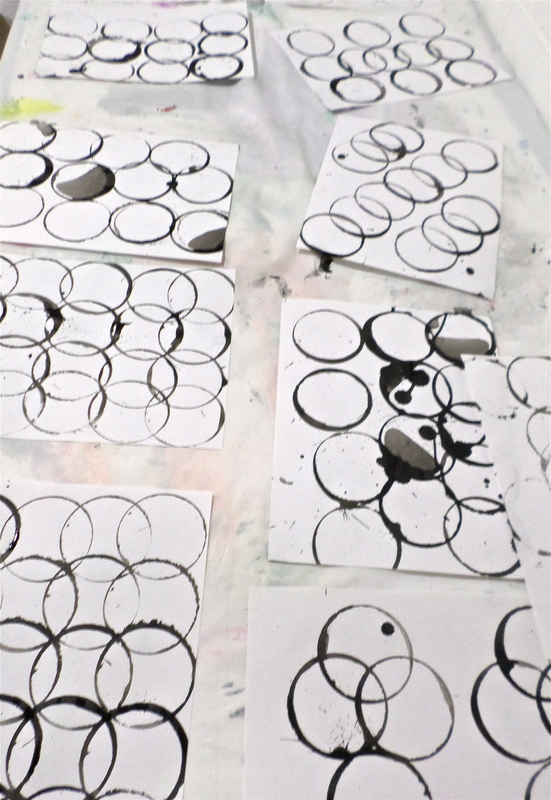 It was an exciting beginning for everyone as to learn to use a brush and create uniform strokes to cover their canvas. 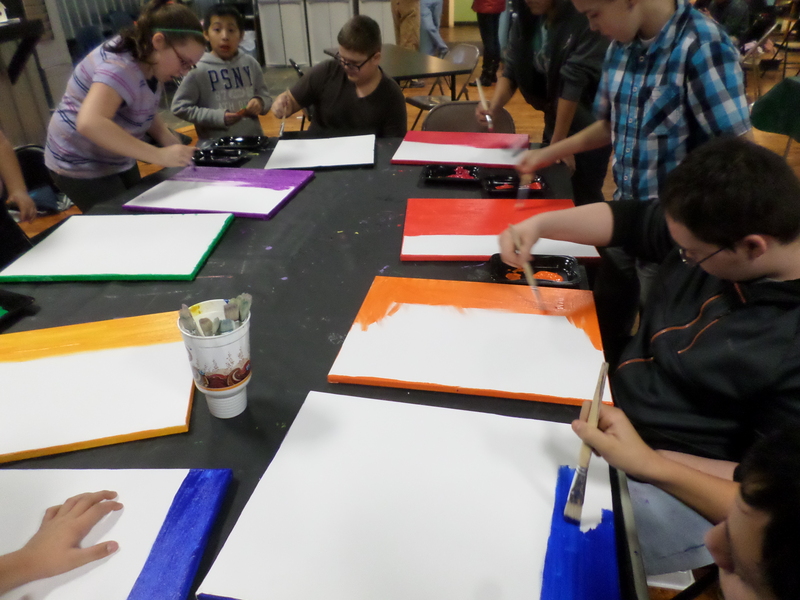 Energy was high as everyone busily covered their blank canvas with a bright color. 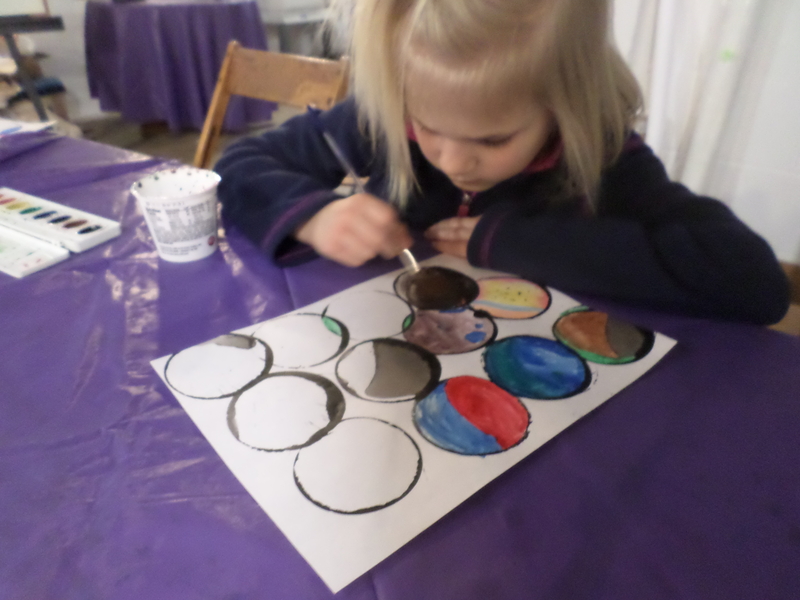 Next week we will begin to mix colors and add shapes to the canvases. It was lots of fun to interact with the student members and see their eagerness to participate. 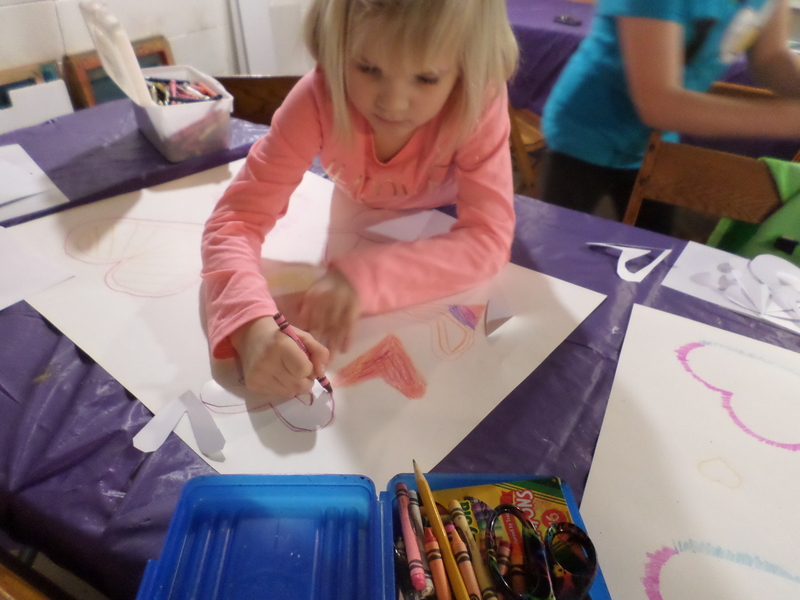 Summer Art Camp is only five months away! During these cold days of winter it’s nice to think of what we have to look forward too. 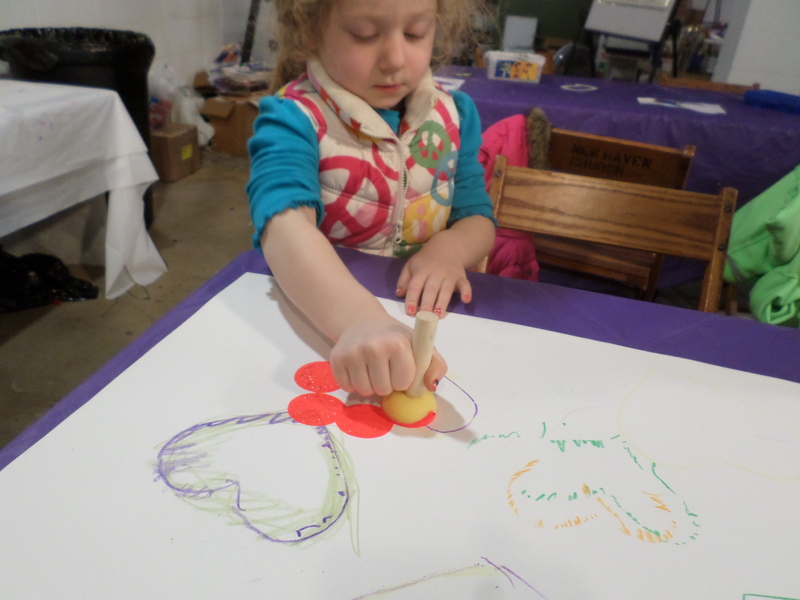 We also have winter workshops at the Art Junction to help beat your winter blues! 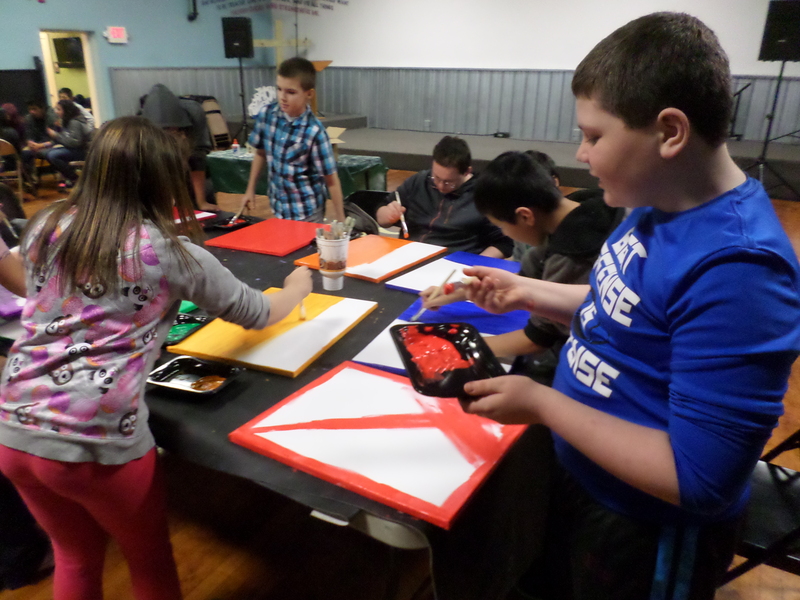 Wednesday afternoon art classes explored creating stencils for their art studio time this past week. 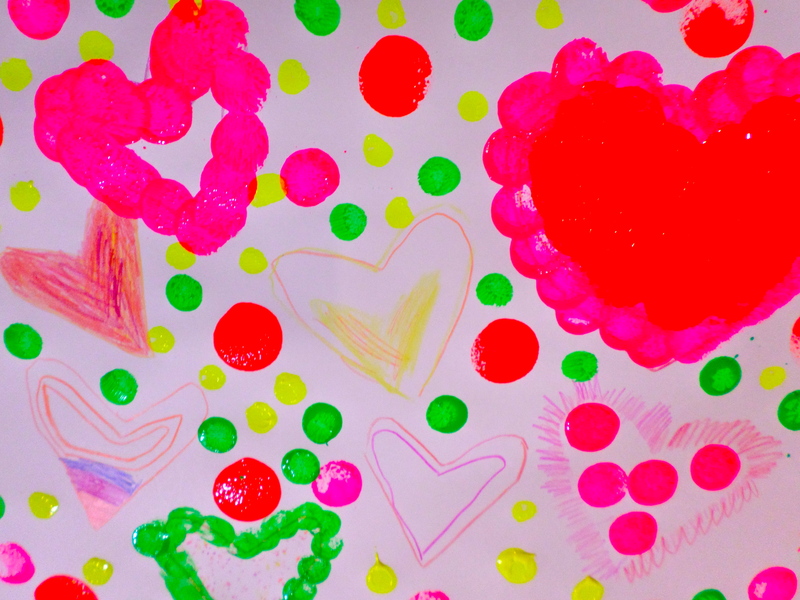 Everyone cut out many sizes of hearts. 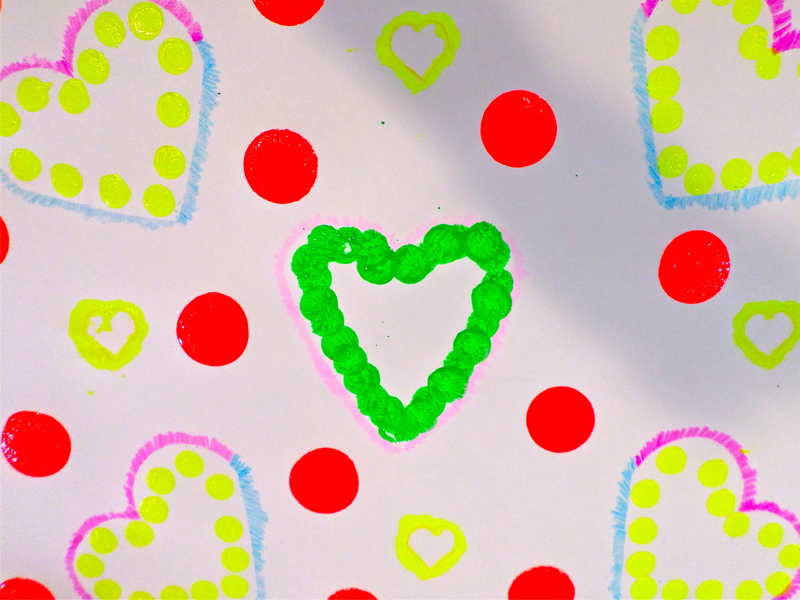 Next they traced and outlined their hearts with crayons. 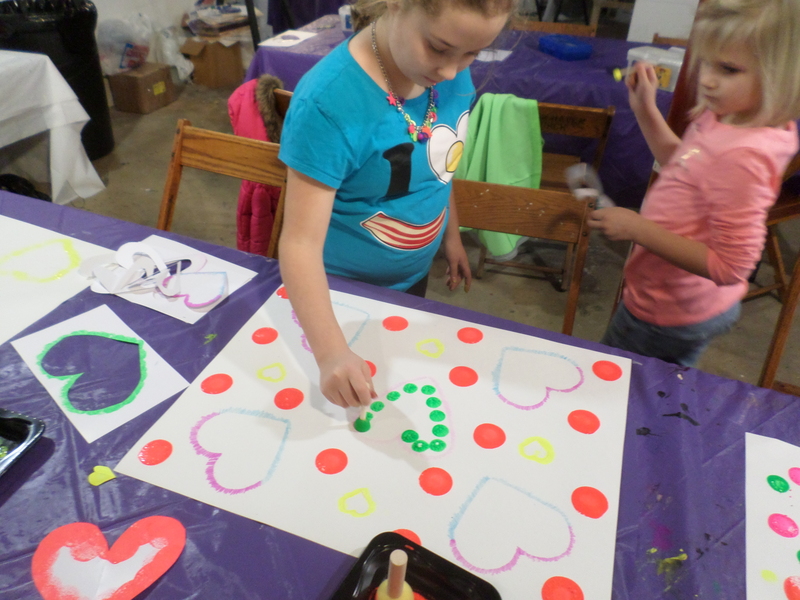 The final step was to use paint and paint daubers with their stencils to create their heart design. Everyone had a unique take on their design. 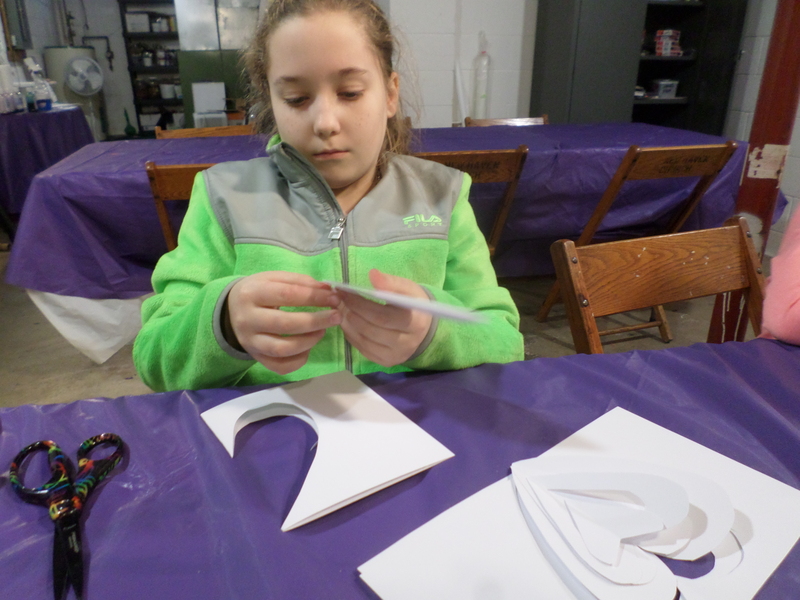 The students were very focused on their work. All the students were part of the creative process. 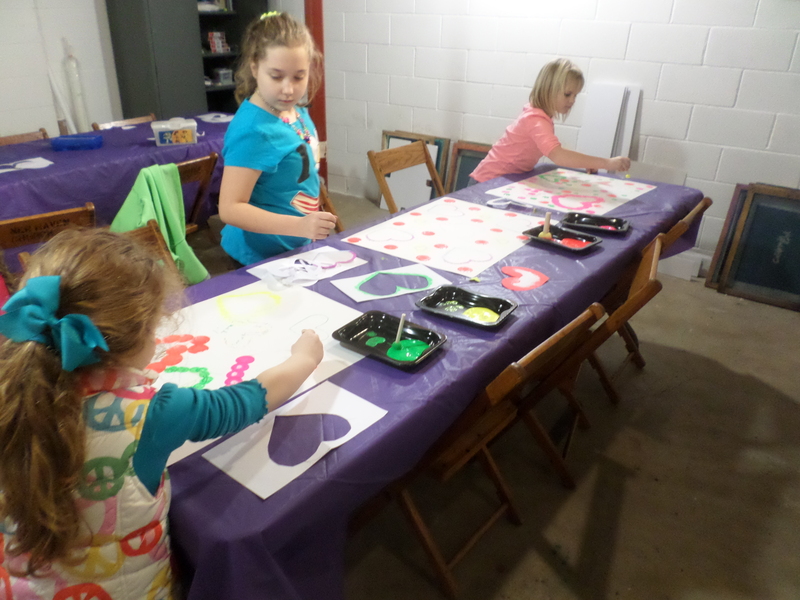 Everyone enjoyed the stencil art heart project. Here are some examples of the students’ work. 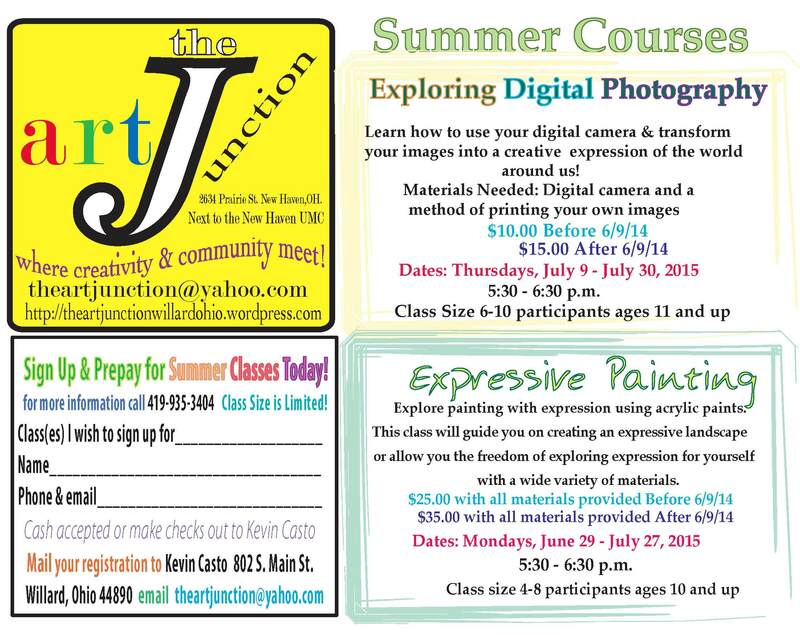 The Art Junction offers classes that allow you to explore your creative expressions. 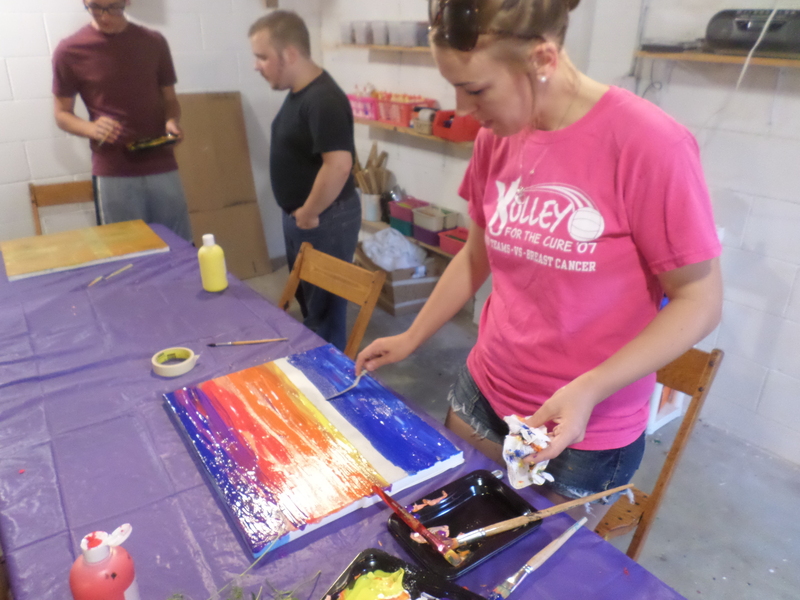 Our expressive painting class is a great way to challenge yourself! 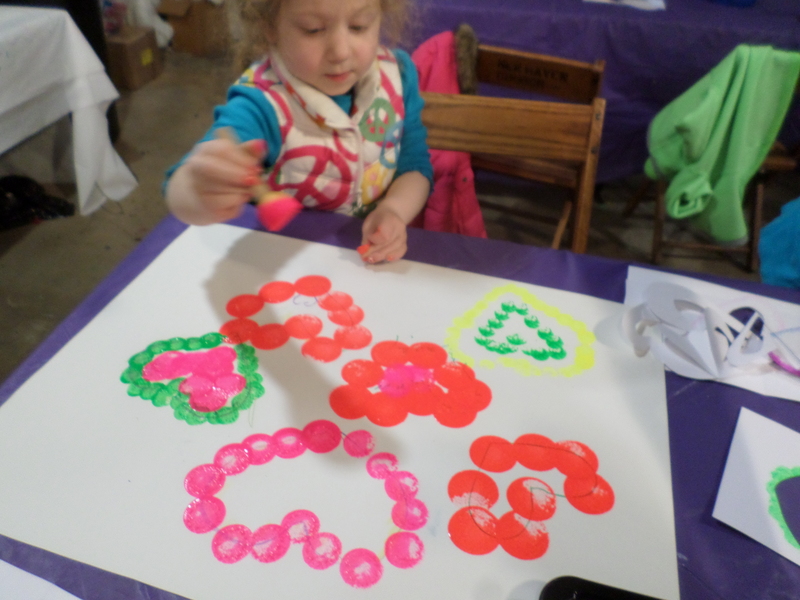 Maybe you can join us for one of our winter workshops! 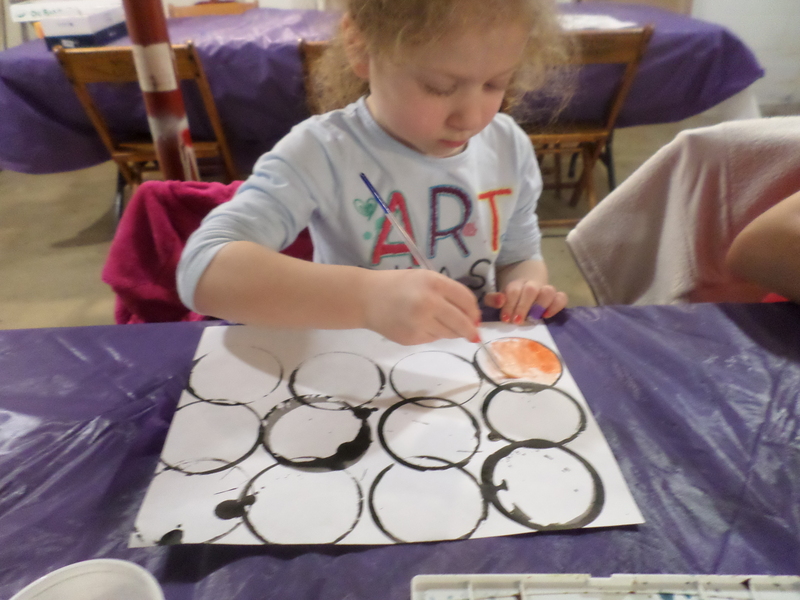 Everyone loves to explore painting and our “Fun with paint” was great time to get messy with many different painting mediums. 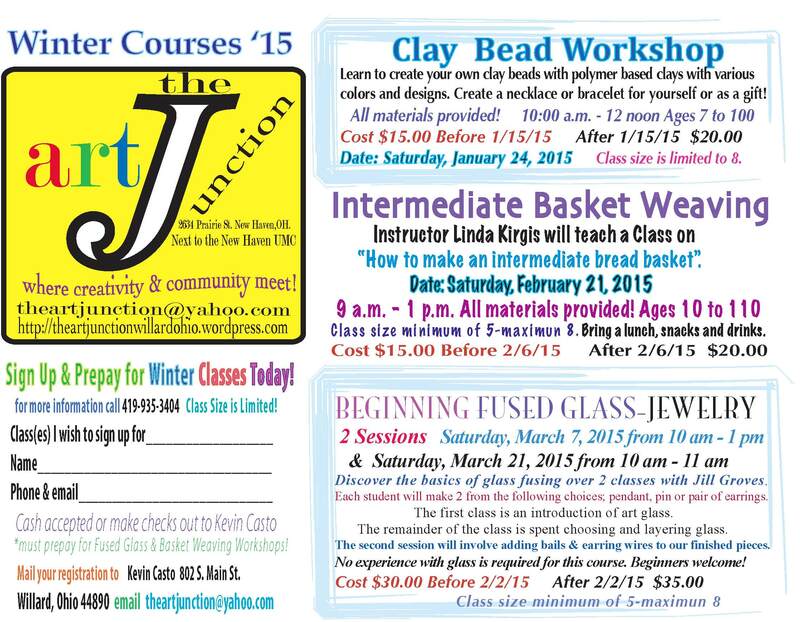 Maybe you can join us for one of our winter workshops beginning soon!